Giving Tuesday is November 27, 2018: Share stories & inspire donations! Last week, Rainbow Rabbit delivered an important message in regards to Giving Tuesday. We’re encouraging those inspired by Rainbow Rabbit to create a Facebook fundraiser, or a #GivingTuesday video with your family, community or staff, explaining and sharing on YouTube, Facebook, and social media how Rainbow Rabbit has affected or inspired you. Please include the hashtag #GivingTuesday and #ColorMeKind on Tuesday, November 27, 2018. The more stories we share, the more money we raise, and the bigger impact our program will have! Team Rainbow Rabbit is also seeking a matching partnership with a donor or corporation for our greatest success yet, and we would love your help in doing so. If you know of an organization that is in line with with Rainbow Rabbit’s goals, please include this donation link in a Facebook post or Tweet with the hashtags #GivingTuesday and #ColorMeKind. We will keep you updated throughout the next two weeks through all of our social media forums on the progress of Giving Tuesday 2018. Thank you kindly in advance for any contributions made towards Rainbow Rabbit! Founded in 2012 by the 92nd Street Y – a community and cultural center in New York City − #GivingTuesday has inspired millions of people to give back and support the causes they believe in. To contribute a donation to Rainbow Rabbit for #GivingTuesday, click here. 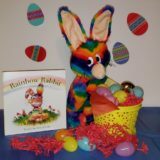 It’s been exactly one year since Rainbow Rabbit announced it’s status as a 501c3: Rainbow Rabbit Educational Services Corp. Now, in recognition of National Nonprofit Day, Rainbow Rabbit would like to thank all of those who continue to donate to our cause of changing the lives of today’s young children! For the second straight year, Rainbow Rabbit Educational Services Corp. was recognized for its transparency with a Bronze Seal on their GuideStar Nonprofit Profile! To offer a donation to Rainbow Rabbit, you can click here. To become a partner or a sponsored donor, please contact [email protected] or Joe Vallee (856) 275-3166.